Join Indian Army Rally in Karnataka, Kerala, UT Lakshadweep & Mahe. 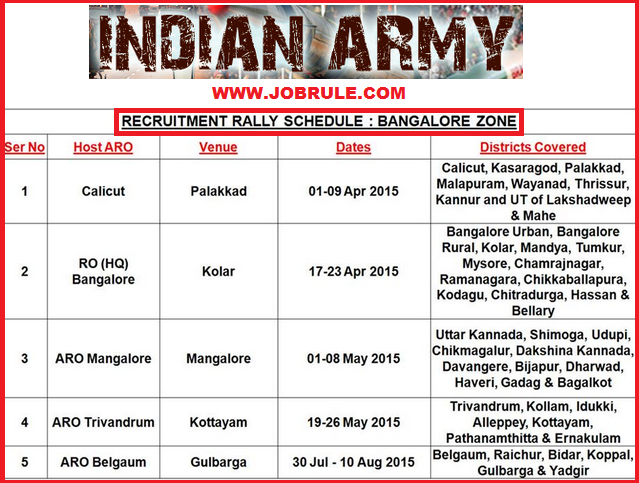 Army Recruiting Office-ARO Calicut (Palakkad), RO HQ Bangalore Kolar Rally, ARO Mangalore, ARO Trivandrum Kottayam, ARO Belgum Gulbarga next Indian Army Soldier Recruitment Rally Schedule/Program Chart for April /May/ June /July & August 2015 (collected from Indian Army official website). Indian Army Soldier General Duty-Sol GD, Sol Technical, Soldier Tradesman, Soldier Clerk/Store Keeper Technical (Sol Clk/Skt), Soldier nursing Assistant-Na etc trades recruitment direct/open rally in HQ RO Bangalore Zone (Karnataka/Kerala). Latest Army Recruitment Rally Advertisement news updates. To read more details ,simply follow our facebook page or browse our Jobrule Website. Best of luck ! Join Indian Air Force-IAF and become an Airmen. 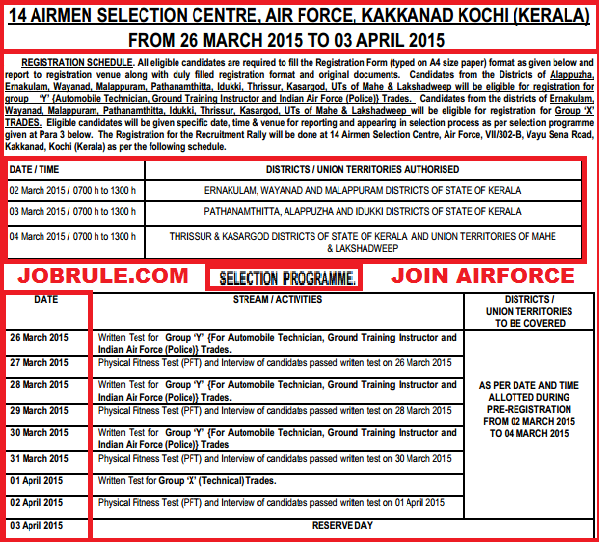 Indian Air Force recruitment Rally for Group X (Technical) Trades and Group Y [For Automobile Technician, Ground Training Instructor-GTI, and Indian Air Force (Police)] Trades at 14 Airmen Selection Centre/Venue, Air Force, Kakkanad, Kochi (Kerala) from 26th March (26/3/2015) to 3rd April (3/4/2015). Indian Air Force offers opportunities for unmarried Male Indian Citizens from the designated districts of state of Kerala and Union Territories-UT of Mahe & Lakshadweep to become IAF Airmen. Upcoming/ Next Defence (Air Force) Airmen Job/Recruitment Rally in Kerala. The recruitment test will be conducted from 7 A.M onwards as per details given below. Candidates will be allowed to appear as per the time and date allotted during Pre-Registration from 2nd March to 4th March 2015. Written Test for Group ‘X’ (Technical) Trades. To read more details about IAF Airmen Kakkanad, Kochi Rally/line Educational qualification, Age criteria, physical Fitness Test-PFT, Physical Measurement Test-PMT, Medical Standards, Written Examination Syllabus & Examination Pattern/Scheme and many more, simply go through below given direct link. Indian Navy an Ocean of Opportunities . Join Indian Navy as Commissioned Officer. 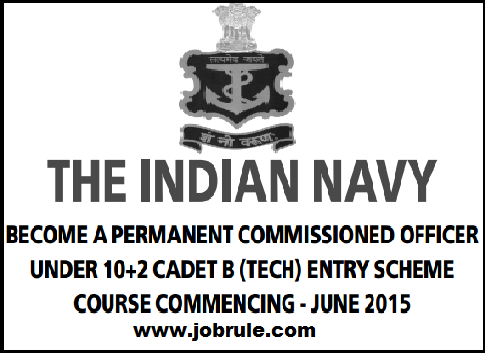 Indian Navy invites Online Application from Unmarried Male Candidates to join the Prestigious Indian Naval Academy, INA Ezhimala, Kerala under the 10 + 2 Cadet (B Tech) entry scheme course commencing from June 2015. 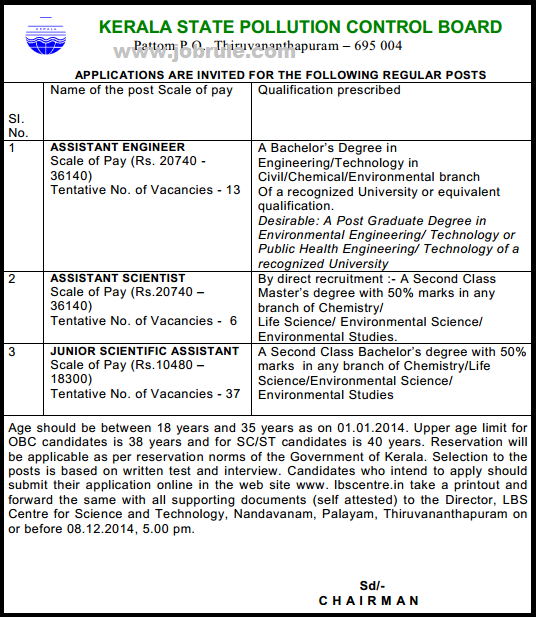 Chairman, Kerala State Pollution Control Board (KSPCB), Thiruvananthapuram ,invites Online Application from interested and eligible candidates for recruitment to the post of ‘KSPCB Assistant Engineer’, ‘KSPCB Assistant Scientist’ and ‘KSPCB Junior Scientific Assistant’ on regular basis. Check above image to get post wise educational qualification, age limit details. 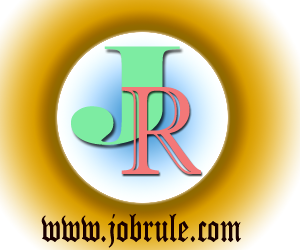 For more information about Online Application Procedure (how to apply), KSPCB Job Syllabus, Exam pattern and many more go through below given official website link. State Bank of Travancore (SBT), Associate Bank of State Bank of India (SBI), Head Office Thiruvananthapuram, Kerala, invites application in prescribed application form from meritorious Sports Personnel (Football/Soccer Player) for recruitment to the post of SBT-Clerk in Kerala Office. To check mode of selection, sport qualification details and other necessaty information , simply go through below given official advertisement link.